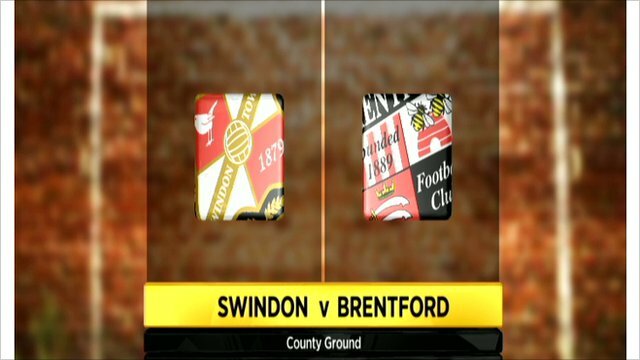 Brentford moved into the area semi-finals of the Johnstone's Paint Trophy after beating Swindon 4-2 on penalties. The tie finished 1-1 after 90 minutes with Charlie Austin putting the hosts ahead, poking home from close range. But Robbie Simpson equalised for the visitors when he headed in Sam Wood's pin-point pass from close range. David Ball hit the post for Swindon but neither side could grab a winner before Ball and Michael Timlin missed in the shoot-out to give the Bees the victory. "You've seen the chances that we've had and created in the second half and if you don't take those guilt-edged chances then you suffer. "Within the last 15 to 20 minutes I think Brentford were hanging on for the penalties and they got what they wanted but it should have never got to that. "Two chances in the whole game and they've scored one of them but you've got to look at our indecision there." 94:34 Penalty scored by Robbie Simpson. Swindon 2-4 Brentford on penalties. 93:59 Penalty scored by Michael Rose. Swindon 2-3 Brentford on penalties. 93:27 Power penalty taken by Craig Woodman saved by Phil Smith. 92:59 Penalty missed by Michael Timlin. 92:38 Penalty scored by Michael Spillane. Swindon 1-3 Brentford on penalties. 91:58 Penalty missed by David Ball. 91:37 Charlie MacDonald scores a penalty. Swindon 1-2 Brentford on penalties. 90:47 Charlie Austin scores a penalty. Swindon 1-1 Brentford on penalties. Correction - 90:01 Penalty scored by Kevin O'Connor. Swindon 1-1 Brentford on penalties. 90:01 Kevin O'Connor scores a penalty. Swindon 0-1 Brentford on penalties. 90:00+6:54 The first player steps forward to start the penalty shoot-out. 90:00+3:24 The referee signals full-time and it's straight to a penalty shoot-out. 90:00+2:04 Free kick awarded for an unfair challenge on Robbie Simpson by Lecsinel Jean-Francois. Michael Spillane takes the free kick. 88:04 Corner taken left-footed by Michael Rose from the left by-line, Headed effort from deep inside the penalty area by Sean Morrison goes harmlessly over the crossbar. 87:05 Charlie Austin has a header from close range and clears the crossbar. 85:35 Charlie MacDonald fouled by Lecsinel Jean-Francois, the ref awards a free kick. Direct free kick taken by Richard Lee. 82:35 Pim Balkestein concedes a free kick for a foul on David Ball. Free kick taken by Scott Cuthbert. 81:27 Michael Timlin has an effort at goal. Save by Richard Lee. Michael Rose takes a inswinging corner to the near post, clearance by Sam Wood. 80:10 Substitution Paul Caddis on for Matt Ritchie. 75:44 Substitution Charlie MacDonald joins the action as a substitute, replacing Nicky Forster. 75:44 Substitution Myles Weston on for Sam Saunders. 75:18 Effort from the edge of the penalty area by Matt Ritchie goes wide of the left-hand post. 69:59 Corner taken by Sam Wood played to the near post, clearance made by Scott Cuthbert. 65:57 Outswinging corner taken by Michael Rose from the left by-line played to the near post, Alan O'Brien takes a shot. Richard Lee makes a save. Corner taken by Michael Rose played to the near post, Robbie Simpson manages to make a clearance. 65:25 Leon Legge is penalised for handball and concedes a free kick. The free kick is delivered left-footed by Michael Rose from right channel. 65:25 Booking The referee shows Leon Legge a yellow card. 62:32 Substitution (Swindon) makes a substitution, with Alan O'Brien coming on for Jon-Paul McGovern. 62:13 Effort on goal by David Prutton from just inside the penalty box goes harmlessly over the target. 61:21 Corner taken left-footed by Michael Rose to the near post, clearance made by Kevin O'Connor. 60:48 Outswinging corner taken by Jon-Paul McGovern from the right by-line, clearance made by Toumani Diagouraga. 60:14 Matt Ritchie fouled by Leon Legge, the ref awards a free kick. Michael Rose takes the free kick. 59:01 Corner taken right-footed by Sam Saunders from the right by-line, clearance by Charlie Austin. 54:42 Kevin O'Connor gives away a free kick for an unfair challenge on Matt Ritchie. Michael Rose restarts play with the free kick. 53:52 Charlie Austin takes a shot. Pim Balkestein makes a clearance. 53:31 Effort from inside the box by David Ball strikes the post. 52:38 The assistant referee flags for offside against Charlie Austin. Richard Lee takes the indirect free kick. 51:00 Foul by Michael Rose on Sam Saunders, free kick awarded. Craig Woodman crosses the ball from the free kick left-footed from right wing, save by Phil Smith. 47:55 Nicky Forster is flagged offside by the assistant referee. Indirect free kick taken by Phil Smith. 46:11 Corner taken left-footed by Sam Wood from the left by-line, Michael Rose manages to make a clearance. 45:00+0:55 The ref blows to signal half-time. 44:11 Corner taken right-footed by Jon-Paul McGovern, Toumani Diagouraga manages to make a clearance. 42:03 Corner from the right by-line taken by Sam Saunders, Headed effort from deep inside the penalty area by Robbie Simpson misses to the left of the goal. 41:33 David Ball is flagged offside by the assistant referee. Richard Lee takes the indirect free kick. 39:29 Unfair challenge on Robbie Simpson by Lecsinel Jean-Francois results in a free kick. Direct free kick taken by Craig Woodman. 38:16 Substitution (Swindon) makes a substitution, with David Ball coming on for Vincent Pericard. 37:21 Assist on the goal came from Sam Wood. 37:21 GOAL - Robbie Simpson:Swindon 1 - 1 Brentford Robbie Simpson finds the net with a headed goal from inside the six-yard box. Swindon 1-1 Brentford. 33:01 Nicky Forster challenges Michael Rose unfairly and gives away a free kick. Direct free kick taken by Michael Rose. 30:56 Outswinging corner taken right-footed by Jon-Paul McGovern from the right by-line, Sean Morrison takes has a header from just inside the penalty box which clears the crossbar. Correction - 24:30 Matt Ritchie is caught offside. Richard Lee restarts play with the free kick. 24:30 Matt Ritchie is ruled offside. Richard Lee restarts play with the free kick. 23:22 The assistant referee flags for offside against Robbie Simpson. Indirect free kick taken by Phil Smith. 21:41 Corner taken by Sam Saunders from the right by-line, Toumani Diagouraga takes a shot. Save by Phil Smith. Corner taken left-footed by Sam Wood from the left by-line, Effort on goal by Michael Spillane from just inside the penalty box goes harmlessly over the target. 19:33 The referee blows for offside against Matt Ritchie. Free kick taken by Richard Lee. 18:12 Matt Ritchie takes a shot. Save made by Richard Lee. 17:30 The offside flag is raised against Charlie Austin. Richard Lee restarts play with the free kick. 17:04 Foul by Leon Legge on Charlie Austin, free kick awarded. Michael Rose takes the direct free kick. Correction - 11:57 Assist on the goal came from Lecsinel Jean-Francois. Correction - 11:57 GOAL - Charlie Austin:Swindon 1 - 0 Brentford Charlie Austin finds the back of the net with a goal from deep inside the penalty box to the bottom left corner of the goal. Swindon 1-0 Brentford. 11:57 The assist for the goal came from Lecsinel Jean-Francois. 11:57 GOAL - Charlie Austin:Swindon 1 - 0 Brentford Goal scored by Charlie Austin from deep inside the penalty box to the bottom left corner of the goal. Swindon 1-0 Brentford. 9:09 Corner taken right-footed by Jon-Paul McGovern. The assistant referee flags for offside against Charlie Austin. Richard Lee takes the free kick. 5:10 The referee blows for offside. Free kick taken by Richard Lee. 4:22 The official flags Nicky Forster offside. Free kick taken by Phil Smith. 3:49 The official flags Charlie Austin offside. Indirect free kick taken by Richard Lee.